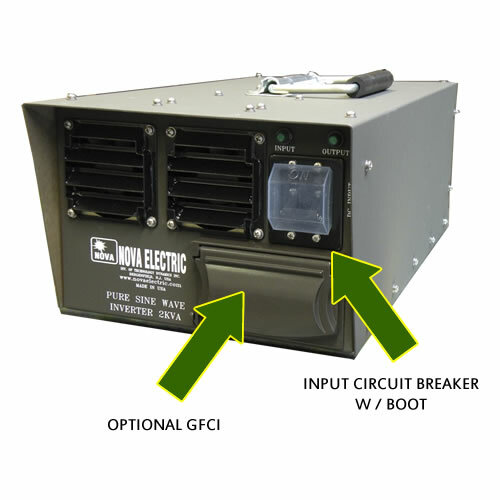 Since 1966, Nova Electric has been a valued supplier of American-made ruggedized AC Power Sources for harsh environment and military applications. 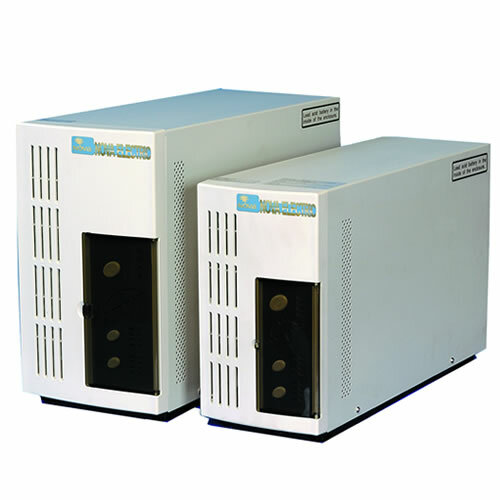 The product line consists of Pure Sine Wave DC-AC Inverters, True On-Line UPS Systems, and Solid-State Frequency Converters in the 120 VA to 320+ KVA single and three phase power range. 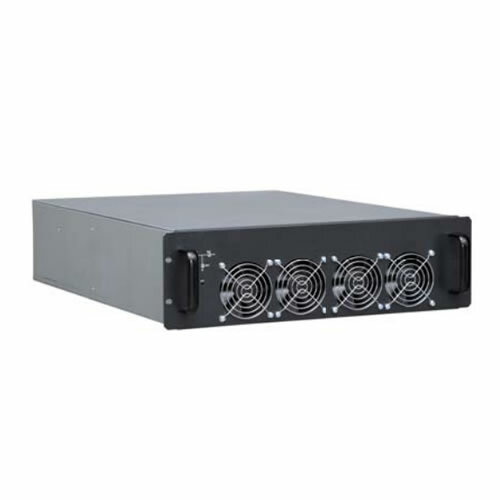 These power sources are offered in a wide variety of standard COTS configurations, which can also be quickly customized per each customer’s unique application. 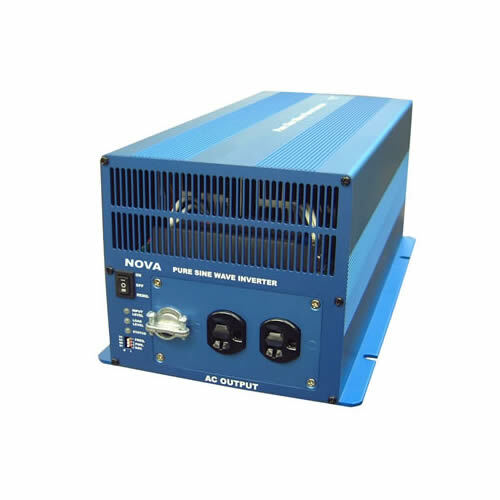 Nova Electric offers a full array of Rugged Pure Sinewave DC-AC Inverter Systems to suit any commercial, industrial, or military application, including those that require Inverters which can withstand Military Environmental and Electrical Standards such as MIL-STD-810, MIL-S-901, MIL-STD-167, MIL-STD-1275, MIL-STD-461, and more. 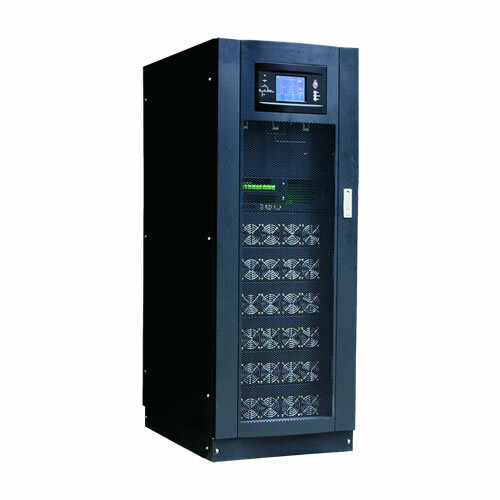 These Rugged Pure Sinewave DC-AC Inverter Systems are available in rack mount, freestanding or wall-mount NEMA cabinet, and custom enclosure configurations to suit applications with tight space constraints. 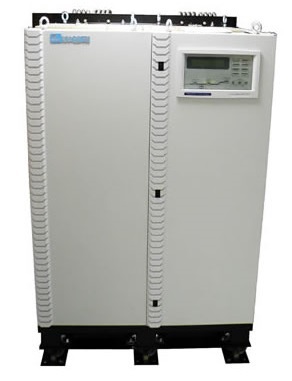 Any standard nominal DC input voltage from 12 to 600 VDC is available, and any standard single or three-phase AC output can be provided, in 50, 60, or 400 Hz frequencies. Finally, all Nova Electric Rugged Pure Sinewave DC-AC Inverter Systems feature our truly Rugged Inverter modular design and robust construction, for many years of reliable performance, as well as the resulting low MTTR, MTBF, and Cost-To-Own figures. 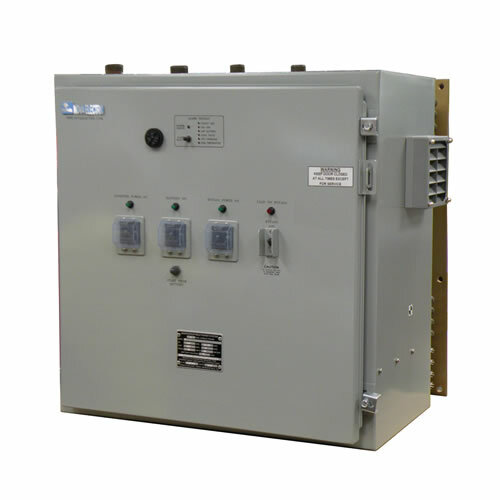 The transformer isolated Galaxy Series Inverters are extremely rugged by design, and feature an optional advanced Internal Suppression Filter Network (ISFN) to suppress the significant transients usually associated with rail and military applications. The units are also extremely reliable, designed to provide many years of service in harsh shock, vibration, humidity, and EMI environments. Nova Electric’s CGL-Series inverters are intended for commercial and industrial applications wherever pure sinewave power is needed at 50 or 60 Hz. These inverters are ideal for running electronic loads such as computers, monitors, printers, telecom systems, radios, fluorescent lamps from batteries, field generators, and solar electro-voltaic panels. They can also drive hand drills, motors and small compressors – please consult the factory for proper sizing. 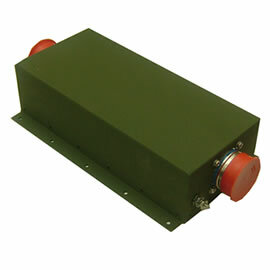 These CGL models can also be optionally ruggedized against shock, vibration, and humidity for military applications including vehicle mounted, shipboard, submarine, aircraft, and ground fixed shelters. The RCGL3K (pure sine wave) inverters are intended for commercial, industrial or military applications wherever standard utility-like power is needed at 50 or 60 Hz. These inverters are ideal for running electronic loads such as computers, monitors, printers, telecom systems, radios, fluorescent lamps from batteries, field generators, and solar electro-voltaic panels. They can also drive hand drills, motors and small compressors. This unit can be ruggedized against shock, vibration and humidity optionally for mobile applications. The NGL modular inverters are intended for industrial or military applications wherever standard generator or utility-like power is needed at 50 Hz, 60 Hz or 400 Hz. 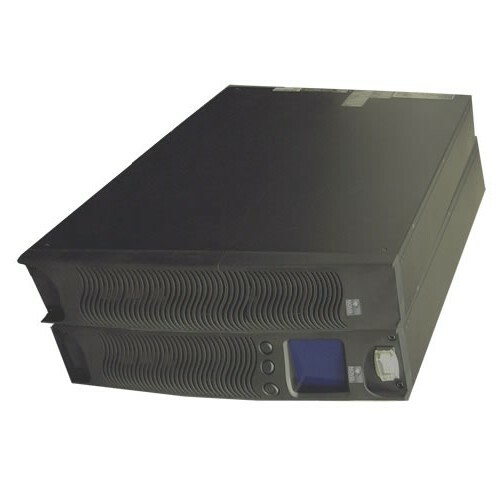 These inverters are intended for running electronic loads such as computers, monitors, printers, telecom systems and radios from 12-270 VDC nominal derived from batteries and field generators. They can also be used for properly scaled hand tools, motors and air conditioner units. 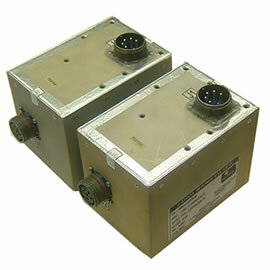 These units can be further ruggedized against shock, vibration and humidity to meet tough military special applications. 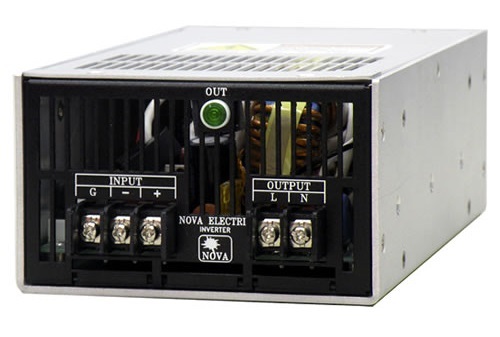 Nova’s Jupiter-Series DC-AC Inverters are high-reliability pure sinewave power sources specifically designed for demanding commercial, heavy industrial, and military applications. They can be built to meet MIL-STD-810, MIL-STD-901, MIL-STD-461, and other standards optionally. These models utilize the most durable components, offering maximum field-proven reliability for severe environment and high reliability applications such as utility stations, shelters, shore power, and communications. 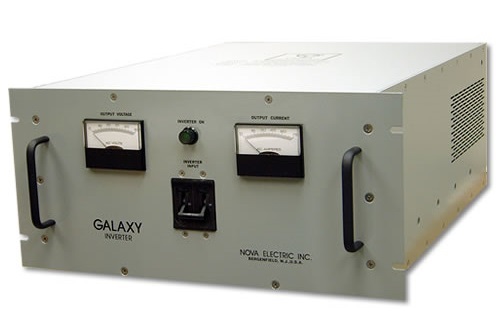 The Galaxy-MIL Series Inverters are extremely rugged by design, and built to withstand the rigors of harsh Environment military applications where MIL-STD-461 and MIL-STD-810 apply. MIL-STD-1275 is optional as well. The units are ultra reliable and used worldwide on a variety of high profile mission critical applications where light weight, high MTBF, and low MTTR are called for. They can be easily customized with a variety of options to fit almost any application from vehicular to aircraft. Military Applications: Including Submarine, HMMWV, UAV, Shipboard, Aircraft, Mobile Power Units, Shelters, Transportable Systems, Tactical Systems, Ground Support, and more. The CGLUPS DC Input UPS is intended for Military Applications wherever pure sinewave battery-backed AC power is required directly from a DC input source. 28 VDC from Aircraft buss or Land Vehicle alternator feeds the CGLUPS and charges the batteries via diode isolation module, which blocks the batteries from feeding back onto the 28 VDC source. If the DC source is lost, the DC UPS continues powering the load using its internal batteries for approximately 5 minutes at full load, 0.8PF. The OCGL (pure sine wave) inverters are intended for outdoor military or industrial applications wherever standard utility-like power is needed at 50 or 60 Hz. These inverters are ideal for running electronic loads such as computers, monitors, printers, telecom systems, radios, fluorescent lamps from batteries, field generators, and solar electro-voltaic panels. They can also drive hand drills, motors and small compressors. These units can be ruggedized against shock, vibration and humidity optionally for mobile applications and offer IP54 protection from the elements. Nova Electric offers a full array of Rugged True Online UPS Systems to suit any commercial, industrial, or military application, including those that require UPSs which can withstand Military Environmental and Electrical Standards such as MIL-STD-810, MIL-S-901, MIL-STD-167, MIL-STD1399, MIL-STD-461, and more. These Rugged UPS Systems are available in rack mount, freestanding or wall-mount NEMA cabinet, and custom enclosure configurations to suit applications with tight space constraints. 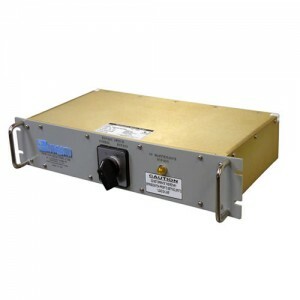 Any standard voltage (single or three-phase) can be accommodated, in 50, 60, or 400 Hz frequencies, and most models can also act as Frequency Converters, changing a given input voltage and frequency to a different pure sinewave output voltage and frequency in conjunction with the usual battery back-up capabilities . Finally, all Nova Electric Rugged True Online UPS Systems feature our truly Rugged UPS modular design and robust construction, for many years of reliable performance, as well as the resulting low MTTR, MTBF, and Cost-To-Own figures. 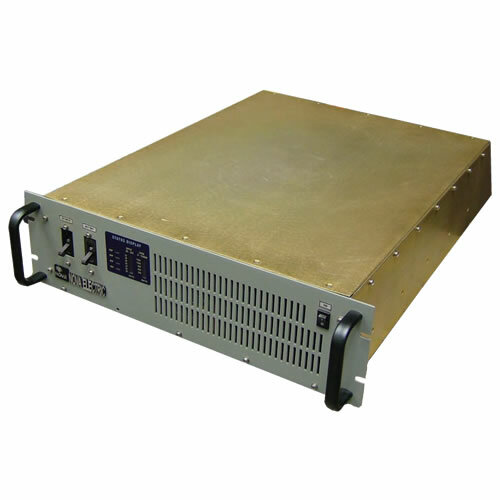 Nova Electric offers a full array of Rugged Solid State Frequency Converter Systems to suit any commercial, industrial, or military application, including those that require Frequency Converters which can withstand Military Environmental and Electrical Standards such as MIL-STD-810, MIL-S-901, MIL-STD-167, MIL-STD1399, MIL-STD-461, and more. 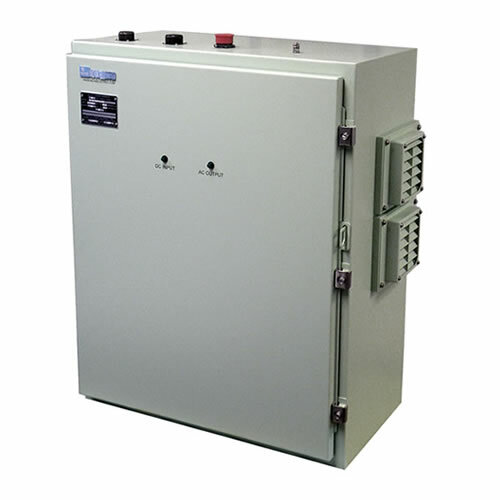 These Rugged Solid State Frequency Converter Systems are available in rack mount, freestanding or wall-mount NEMA cabinet, and custom enclosure configurations to suit applications with tight space constraints. Any standard AC single or three-phase voltage can be accommodated, in 50, 60, or 400 Hz frequencies. Finally, all Nova Electric Solid State Frequency Converter Systems feature our truly Rugged Frequency Converter modular design and robust construction, for many years of reliable performance, as well as the resulting low MTTR, MTBF, and Cost-To-Own figures. Nova Electric’s transformers are all designed and built in house to exact customer specifications from 250W to 500+KW and beyond. Only the highest quality materials are used, and customers can specify special wire or hardware requirements. Each transformer produced is made to a UL 220°C class H insulation system with HPT insulated copper magnet wire and Nomex insulation. To protect against moisture, each transformer is varnished in a vacuum impregnation system and then coated with a black top coat. Each transformer also undergoes a very thorough inspection process that includes hi-pot and continuity testing, as well as visual inspection. 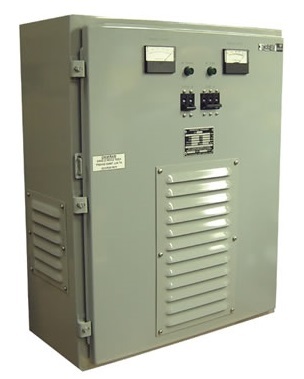 Transformers are available in freestanding, rack mount (with or without chassis slides and shock bull pin receptacles), or sealed portable enclosures appropriately ruggedized for military or harsh environment applications. Connectors and other miscellaneous options can be ordered as per unique customer requirements. Due to the “built to order” nature of these accessories, we encourage any interested customers to forward us complete details of what they require – electrical and environmental specs, space and weight constraints, quantity required, etc. – so that we may propose the most effective solution. Customers are encouraged to e-mail complete specifications or call to discuss such applications with a project engineer so that we can tailor our solution to your specific needs. 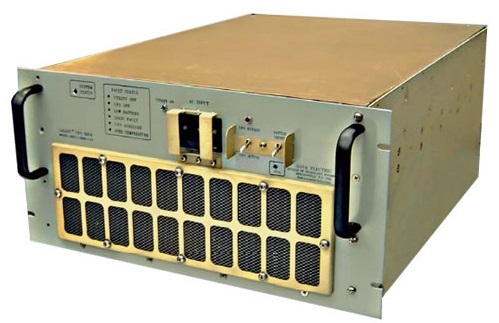 Nova’s extensive experience in designing and manufacturing MIL-STD-461 compliant UPSs, DC-AC Inverters, and Frequency Converters allows us to design and build custom EMI filters to customer specifications. Our specialty is filters which attenuate conducted emissions to comply with the CE102 limit of MIL-STD-461. Single and double-stage EMI Filters ranging from 20A to 300A, for line voltages of 120VAC, 240VAC and 440VAC single phase. Insertion loss depends on size, but 40dB at 150KHZ is possible. 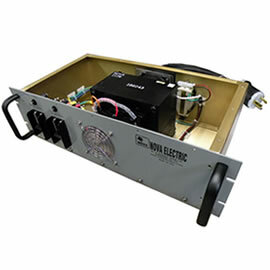 Nova offers an extensive line of such filters ranging from 20A to 300A for three-phase Delta and Wye configurations. Nova offers turnkey design and fabrication of custom military-grade encapsulated filters for EMI compliance to the CE102 limit of MIL-STD-461. The process starts with the customer obtaining a scan of the CE102 under the desired operational conditions. If the scan shows outages above the limit, this scan can be used by Nova engineering as a basis for the design of a specialized filter that can attenuate the conducted emissions to within 3-6 DBs below the limit. A prototype of this filter is then constructed for a repeat test to prove that compliance is achieved. The custom filters can be made in specified size, shape, and mounting configurations. They can also be equipped with military connectors (circular MS-Series preferred) for the input and the output. Compliance to MIL-STD-461 usually requires a multi-stage filters which achieve 40-80db insertion loss (attenuation) and dampened self-resonations. Often times, these filters contain 3-4 cascaded stages and dampening networks. Often such filters are mounted on the input razor back panel of military racks, becoming the AC power input port to the end product. 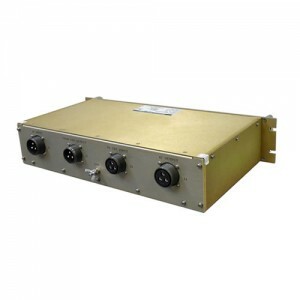 Others applications include custom DC input EMI filters for HMMWV powered inverters and DC-DC converters. Nova offers custom filters for low frequency (3rd harmonics and up) in the 100HZ to 14KHZ frequency range. These filters are a multi stage, linear design using passive components . As such they do not produce any switching noise and can be added externally to systems which lack active PFC (Power Factor Correction) circuitry. The custom filters can be made in freestanding or rack-mount configurations, and are usually equipped with military connectors (circular MS-Series preferred) for the input and the output. 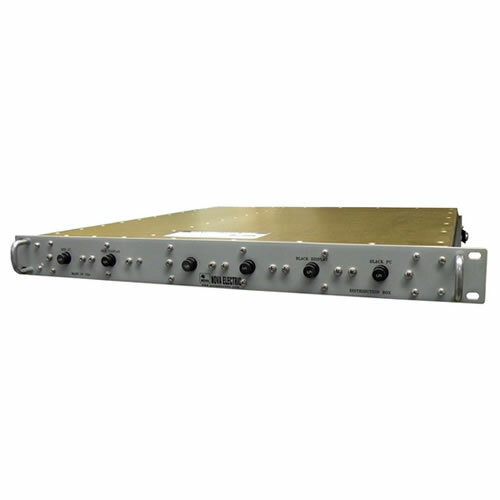 Nova also offers custom designed filters for very high attenuation and very wide frequency ranges. Such filters are often used in IT products (VME, CPCI chassis, printers, ATRs, etc.) and communication equipment. For More Details: Due to the “built to order” nature of these accessories, we encourage any interested customers to forward us complete details of what they require – electrical and environmental specs, space and weight constraints, quantity required, etc. – so that we may propose the most effective solution. Customers are encouraged to e-mail complete specifications or call to discuss such applications with a project engineer so that we can tailor our solution to your specific needs. In applications where external MBS are required in harsh environment, industrial grade products often fall short in being able to withstand high shock, vibration, and humidity for extended periods of time. Now, the same standalone MBSs previously only supplied with Nova’s military power conversion equipment are available for purchase on their own. Rack mount and bulkhead mount versions are available, all featuring the same ruggedized construction that allows our supplies to be qualified to MIL-STD-810, MIL-S-901, MIL-STD-167 and other related environmental standards. When used with one of our UPS systems, the External Maintenance Bypass Switch allows the complete removal of power from the UPS system for safe service and maintenance, while maintaining power to the load. 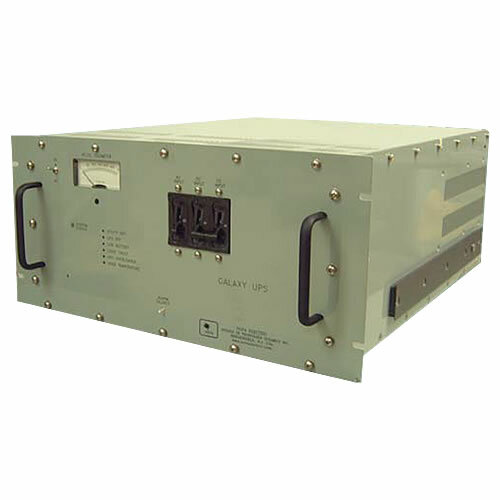 Nova Electric offers a full line of COTS and MOTS Power Distribution Units (PDU) designed to manage power capacity and functionality for military and harsh environment applications. The same robust construction that characterizes our MIL-STD-810, MIL-S-901, and MIL-STD-167 AC Power Sources applies to our PDUs, which are also available with enhanced filtering to meet MIL-STD-461 and Tempest-Grade requirements. Our PDU offerings feature a nearly unlimited selection of choices from chassis configurations (rack mount, freestanding, bulkhead mount, wall mount, and more), connector styles, switches, breakers, indicators, and more. We can use an existing baseline product, a modified version of an existing product, or a clean-sheet purpose-built product designed and manufactured to your exact specifications. 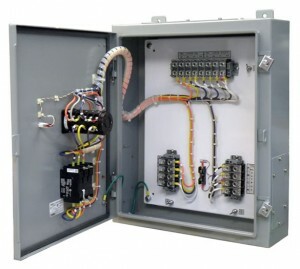 Nova Electric’s plant in Bergenfield , NJ includes all necessary facilities for the complete design, manufacturing, and testing of Rugged Custom Power Supplies, including: engineering R&D labs, printed circuit board stuffing and wiring harness stations, subassembly and transformer manufacturing, final assembly, and environmental and electrical testing. An in-house machine shop serves to produce customized sheet metal quickly and accurately. Having all facets of the design and production of our Rugged Power Sources under one roof ensures total quality and gives Nova Electric the ability to rapidly customize our standard Rugged Power Sources as required. Depending on the application, Nova Electric can collaborate with the DC Power experts at our parent company, Technology Dynamics, to offer extremely advanced customized supplies which have both AC and DC capability. These supplies are usually designed for specific military applications (powering weapons systems in “Fast Attack” submarines or environmental control systems on HMMWVs) and are built to order. Specific areas of expertise in customized supplies include water cooling, high-frequency (lightweight) topology, custom enclosures, and high-power applications. 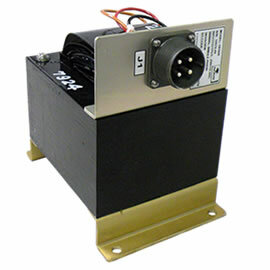 Please contact us with your specific application, so we can offer you a solution to your power conversion requirements!